If you frequent the local gym, you have probably noticed people hanging off the roof and wondered a) what they are doing and b) how long it would take you to face-plant trying to do the same thing. That strappy hanging situation is called TRX or Total Resistance eXercise, and it’s a game changer. Basically, hanging around like that forces the muscles of the core and back to work like crazy to hold the spine in proper alignment. To break it down, these are the reason TRX is awesome. Pretty much everyone loves TRX. The ones truly drawn to it are those who like Yoga and Pilates as there are a few crossovers. But it’s also great for beginners through to professional athletes. TRX offers a cardio workout, a resistance workout, a muscle flexibility workout, and balance. No matter what your goals are, the benefits of TRX are universal. TRX seems intimidating, but once you actually give it a go, you will find it relatively intuitive. It is basically all of the moves you are used to but suspended in the air. Setting up the equipment is simple and easy to learn, but it’s important to make sure the TRX is securely attached to its anchor point (I learned this the hard way). Another advantage in using your own body weight and gravity is that you’re able to easily adjust to your own personal fitness level. You have complete control of the intensity just by walking yourself closer or further away from the anchoring point. As we all know, unless you shake things up from time to time your workouts can become less effective. TRX is a great way to bring something new to your regime. You’ve got two suspension straps and infinite ways to use them. One of the things I hate most about the gym is the fact that nobody understands that my evil glare means I want the machine they are on. I really hate waiting. 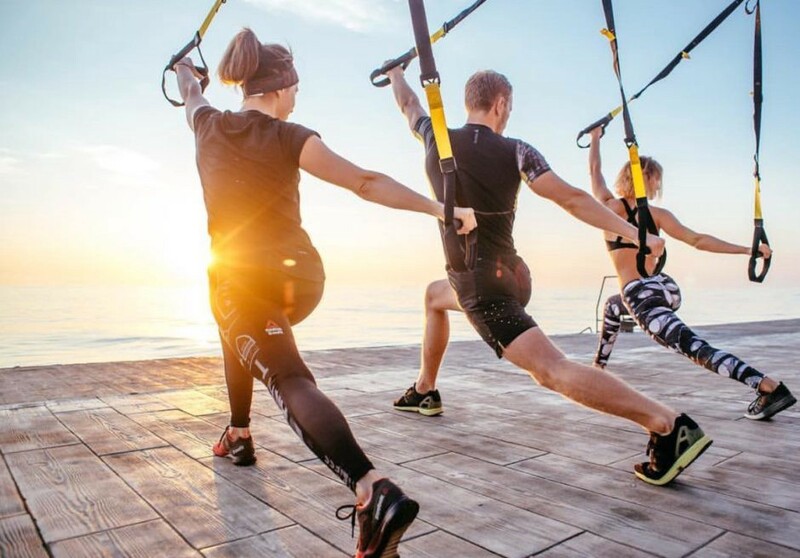 TRX is great because you can do an entire workout in one place. No more pacing and sighing in irritation in front of poor soles just trying to workout in peace. Also, if you aren’t spending any time waiting around, you will find that you minimize your training time by switching from one exercise to the next in just seconds. The absolute best thing about TRX is it can be set up pretty much anywhere. Just pack it up and take it to the beach, do a workout in your own home, or bring it along with you when traveling. I’ve even taken it to the park on my lunch break after the guilt’s of a few missed gym sessions. So in summary, those monkey men at the gym are onto something. And as risky as it looks, you shouldn’t let the fear of a few face-plants get in the way of your killer core.